Our round up of the best things to do in Trier Germany for the whole family. A guide to Trier attractions, excursions, hotels and interesting facts about Germany’s oldest city. The first time I learned about Trier, Germany, it was from the pages of a school book. The Italianised version of its name, Treviri, was looking at me from the much-slaved-on pages of my history manual, while my sixteen-year-old-self tried to make sense of the many names associated with this important historical city. Augustus, Constantine, and what’s Karl Marx got to do with it again? Everything seemed to suggest that Trier was a crucial location for European history and the fact that I could hardly place it on a map had a severely disconcerting effect. It was only in college that the history of this city slowly started to come to life for me, with all its interesting twists. It took me even longer to realise that Trier was not just a culturally significant place but also a beautiful one that deserved to be included in Germany travel itineraries. Home to no less than 9 UNESCO World Heritage Site in and near the city, Trier is full of attractions and has a family friendly vibe that put it on my radar as a great place for a learning escape. 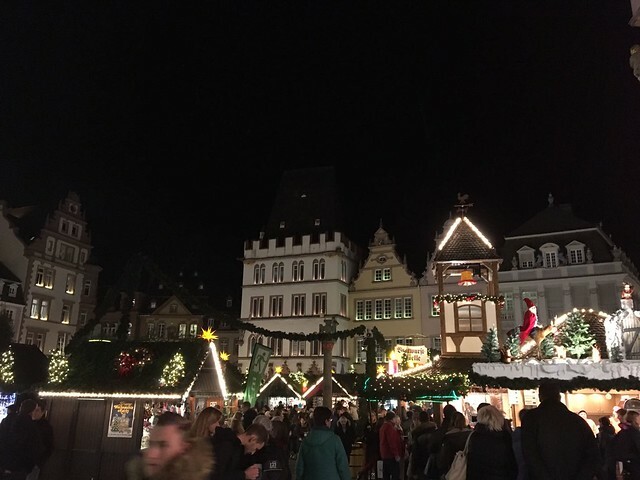 It is culturally rich, friendly and in the winter it also hosts the Trier Christmas market that is guaranteed to put you in the Christmas spirit. What is Trier Germany known for? Trier is a city in the West of Germany, in the Rhineland-Palatinate: it lies on the banks of the river Mosel and it is close to the border with Luxembourg and France, both located to its West. It is served by several airports (including Luxembourg, Hahn and Saarbrucken), as well as an extensive network of bus routes and trains. How to get around: Trier is a highly walkable city and many sites are a short stroll away from each other. Metered taxis are available for longer distances. Tip for families visiting Trier with kids: If you are travelling with kids it will not take them long to spot the Roemer Express, the little tourist train. The Roemer express is super colourful and offers frequent tours that touch on some of Trier’s main sites: it’s an easy way to spend half an hour and the commentary in several languages makes it also a nice way to get acquainted with the history of the city. A great option for tired little legs! Hotel Constantin Trier: a very popular hotel and a favourite for families thanks to its spacious rooms. Its location along the river is pleasant and if you are here in the summer it is a great place to access the Moselradweg Bicycle Route. The quadruple rooms are good for families, offering a double bed, sofa bed and free wi-fi. Hotel Blesius Garden: a short bus ride from the historical centre of town, this hotel is gorgeous and has an indoor pool and playground. The best rooms to get are the ‘garden room’, that can host up to 2 adults and 2 children. *Please note: this post contains affiliate links and if you make a purchase through them we might make a small commission at no extra cost to you whatsoever. We only recommend hotels we believe will offer you a pleasant stay. If you are like me (a history junkie cursed with a short memory for names), you might have the name Trier in mind and still struggle with the question: what was Trier know for again? 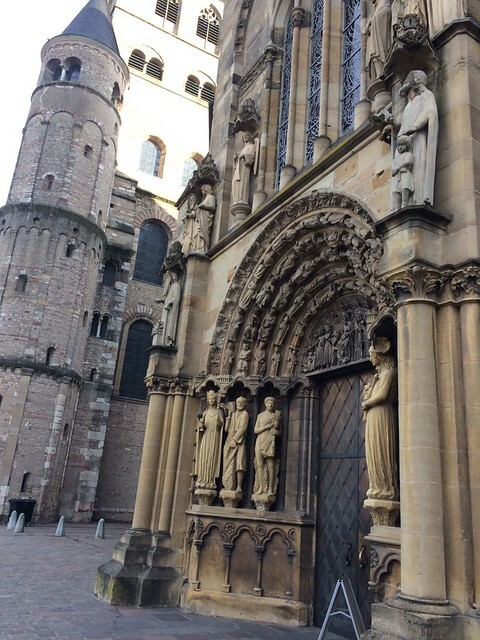 A family guide to Trier, Germany. Trier is the oldest city in Germany and a great destination to visit with children. Discover Trier’s famous Porta Nigra, its amphitheater and medieval streets for a stroll through history and don’t forget to stop at Trier’s toy museum and Christmas market. If you have seen photos of Trier, chances are they were of the Porta Nigra, the Black gate. It is Trier’s most famous landmark and the one most guided tours of the city start from. It was built by the Romans around 180 A.D, under the reign of Emperor Marcus Aurelius and it is a very impressive building. It is made of massive sandstone blocks, laid one on top of the other without the use of mortar (they were held together by iron brackets, most of them subsequently stolen during the Middle Ages) and it has a severe look that immediately brings to mind images of war and foreign people assaulting this Romans’ stronghold. Despite this war evoking exterior, however, it is likely that this gate was built more to impress visitors than to keep ‘barbarians’ away. At the time of its construction the Roman Empire was living in relative peace and historians find it hard to accept that so much effort was put into a defensive construction without an imminent threat. Rather, they believe the gate wanted to impress the visitors and portray the image of the wealthy city Trier had become known to be (in Latin,it was known and ‘urbs opulentissima’ = very rich city). Whatever the truth, there is not doubt that the impression was made, at the time and still very much nowadays! Tips for families travelling with kids. Kids are unlikely to be impressed by the Porta Nigra. While its size is imposing, there is not much there to pique their attention beside the cars zooming by it. The good news is that you can visit the gate quite quickly and, if you are in luck, you may catch sight of a centurion! He is in charge of the guided tours to the door and its elaborate costume is likely to catch children’s attention. More memories of the roman empire can be found at the Roman baths and amphitheatre, also worth visiting. Trier Roman baths are a very impressive complex: when built, they were among the biggest in the Roman empire and still now their proportion elicit awe and surprise. The visit covers both over and below ground structures and it is very interesting to learn what these huge thermal complexes entailed in terms of engineering. The amphitheater hasn’t got the big proportions of the Colosseum in Rome but it is still an important space and each year still hosts shows: in September I heard the city hosts the Trier’s Bread and Circuses’ Roman festival with shows and activities for adults and kids! Another important landmark in Trier is Constantine’s throne room, ConstantinBasilika or Aula Palatina. The Basilica was built by order of Constantine during the 4th century A.D. and it remained in use during the Middle Ages as the residence of the Bishop of Trier first and then as a protestant church. What is really impressive about this building and what makes it one of main things to see in Trier is its size: immense not just for ancient but also modern standards, the Basilica is 27 m (90 ft) wide, 33 m (108 ft) high, and 67 m (220 ft) long – with an adjoining hall outside even 75 m (250 ft). If such a size wasn’t enough, both the windows of the apse as well as the niches underneath become progressively smaller towards the middle, enhancing the impression of length with a clever, if unnecessary, optical illusion. Attached to the Basilica there is another historical building, the electoral palace, which is worth noticing as usually considered the best example of Rococo architecture in the whole of Germany. Trier maintained an important role well after the Western Roman Empire met its fate and Trier’s city centre bears witness to this with gorgeous cobbled streets, elaborate churches and houses that seem out of a traditional fairy tale book. The best way to experience the city is on foot and my advice is to make time to explore at least some of the city’s churches. They are among the oldest in Germany and Trier cathedral in particular hosts important religious relic: tradition tells us that Elena, Constantine’s mother, brought back here Jesus’ robe, all the way from Jerusalem! Trier has some gorgeous churches, some of them even appearing on the UNESCO World Heritage Site list. Monuments aside, it is the whole of Trier town centre that makes you feel like you stepped back in time. Trier Haputmarkt, the main historical square, is gorgeous. Germans are known for being excellent toy makers so a toy museum in a historical German town can only be a spectacular place to bring kids. The Trier toy museum is on Hauptmarkt and has 2 floors with a collection of toys defining the history of play from over 100 years ago to now. A visit to Trier in December cannot be complete with a stop at Trier’s Christmas market! The market opens at the end of November and stays open until just before Christmas day: it hosts over 90 stalls and it takes place in the main medieval square, with the stunning backdrop of the cathedral. Trier is in a lovely area of Germany and it is a good base for local excursion, especially during the spring and summer months. Roscheider Hof open air museum is located about 8 km from Trier, in Konz, and it is worth a mention because it is an interesting place for adults and one kids can easily enjoy while absorbing some of the cultural history of the region. This open air museum has exhibitions and demonstrations of traditional rural life as it developed over the course of the centuries. The exhibits are organised to make the visitor feel immersed in the life of a rural village and teach kids of jobs they are, often, not familiar with anymore such as the blacksmith, the mill worker or stone carver. Trier is on the river Moselle and water excursions are available in all seasons. Depending on the time you have, you can have cruises as short as 1 to 2 hours or take full day trips to discover the beautiful countryside outside of the city. In the winter, the cruises change schedule but do not stop and even take on a seasonal character: how about a mulled wine cruise in the middle of a winter wonderland? I am sure tempted! I hope you enjoyed this short virtual stroll in Germany’s oldest city! Have you visited Trier? Do you have a favourite attraction we should add to our list of must-see things to see in Trier?